The success of Apple's AppStore for iPhone and iPod Touch has prompted two major rivals to follow suit. Handset giant Nokia and Microsoft have announced their own versions of the online markets for mobile device application software, or apps. From May, Nokia's Ovi Store will offer apps as well as multimedia content specific to a user's location. Microsoft's new "Windows Phones" will feature Windows Marketplace, launching in the last quarter of 2009. Microsoft has also announced a service allowing synchronisation and backup of data from mobiles "in the cloud". One of the standout stories from 2008 in the mobile communications world was the success of Apple's AppStore - a marketplace allowing developers to write programs ranging from productivity utilities to games. At the Mobile World Congress in Barcelona, there are reports that other firms - from Blackberry's Research in Motion to Samsung - will also follow Apple's lead. Mobile operator Orange announced a similar marketplace for mobile "widgets" earlier on Monday. Nokia's Ovi Store brings together its existing Download! service with its multimedia service MOSH, along with the now-familiar concept of a marketplace for apps. Like Apple, Nokia will take a 30% cut of profits from selling apps, and has already partnered with a number of firms to provide content, including EA games, Facebook, MySpace, and Lonely Planet. The key feature distinguishing the service from the AppStore, is its ability to provide content - be it apps, podcasts, or games - that is tailored to the user based on personal information, at the user's present location, and based on the user's prior habits. 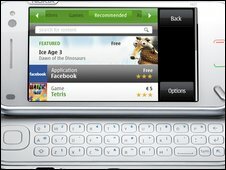 The first devices to feature the storefront will be the N97, released in June. In the meantime, existing mid-range Series 40 and more high-end S60 handsets will be able to access the service when it goes live in May. "No real surprise here," says Tony Cripps, principal analyst at Ovum. "But Nokia's Ovi Store is not simply a 'me-too' take on the barnstorming iPhone App Store." For one thing, Mr Cripps says, the personalised nature of the experience sets it apart - but users may not like the means of payment, including operator billing and credit card processing instead of Apple's all-in-one shop. Microsoft's storefront will gather together what Aaron Woodman, director of consumer experiences for Microsoft's mobile communications business, said was an existing library of some 20,000 applications for Windows Mobile. "For us it's about taking friction out of a marketplace that already exists today," he says. "It's really about connecting people with those apps in a way that they're more discoverable and there's more trust in the transaction. 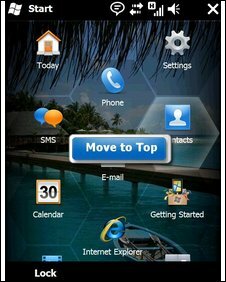 Microsoft's latest version of its Windows Mobile operating system has a number of small changes both to the aesthetics and to usability. 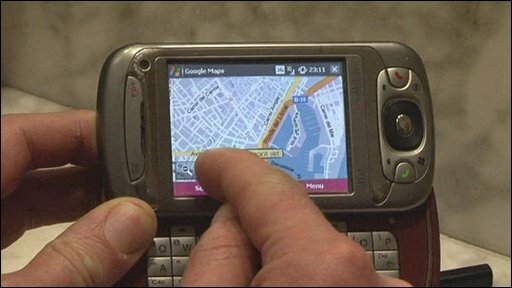 "We've been making software for phones for the last 7 years, and we can easily see the next 10," Mr Woodman told BBC News. "I think before now it was really an offshoot, but not really fulfilling on the promise of what people expect from Windows." In order to differentiate itself from other operating systems in an increasingly crowded market, Microsoft has announced MyPhone, a service that will allow users to synchronize the contents of handsets with other Microsoft products such as Windows Live. Nagappan Arunachalam, chief marketing officer of software firm NewBay, says that the synchronisation push had already started within the industry, and that services had until now been offered by mobile network operators (MNOs) themselves. NewBay sells software to MNOs, and 250 million subscribers are already backing up using NewBay's technology; in the UK, O2's Blue Book backup service is based on it. Dr Arunachalam said that since the data passed through the MNOs anyway, it was easier to regulate and operate a backup service. "They own the pipe. If anyone else wanted to do this, the operators would need to divert it," he said. "We enable the operators to compete with Microsoft on this kind of thing." Nevertheless, Microsoft still believes that brand loyalty to Windows will drive the uptake of Windows Mobile devices - which it is now rebranding simply "Windows phones" - and deliver the market share it has been lacking. "We talked to Windows users and asked them about their experience," said Mr Woodman.